"Don’t Let the Back Door Hit You"
Lifelock is running infomercials or just really long ads on TV. The LifeLock CEO’s identity stolen 13 times in the past. 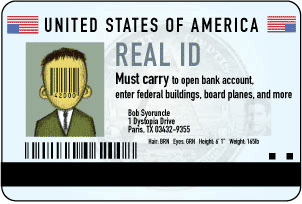 In February, the opponents of REAL ID were given a bit of hope when Homeland Security Secretary Janet Napolitano said that she wanted to repeal the REAL ID Act, the federal government’s failed plan to impose a national identification card through state driver’s licenses. But what has taken place since is no return to sanity, as political machinations have produced a cosmetic makeover called “PASS ID” that has revived the push for a national identification card. The PASS ID Act (S. 1261) seeks to make many of the same ineffectual, dangerous changes the REAL ID Act attempted to impose. Fundamentally, PASS ID operates on the same flawed premise of REAL ID — that requiring various “identity documents” (and storing that information in databases for later access) will magically make state drivers’ licenses more legitimate, which will in turn improve national security. Proponents seem to be blind to the systemic impotence of such an identification card scheme. Individuals originally motivated to obtain and use fake IDs will instead use fake identity documents to procure “real” drivers’ licenses. PASS ID creates new risks — it calls for the scanning and storage of copies of applicants’ identity documents (birth certificates, visas, etc.). These documents will be stored in databases that will become leaky honeypots of sensitive personal data, prime targets for malicious identity thieves or otherwise accessible by individuals authorized to obtain documents from the database. Despite some alterations to the scheme, PASS ID is still bad for privacy in many of the same ways the REAL ID was. And proponents of the national ID effort seem blissfully unaware of the creepy implications of a “papers please” mentality that may grow from the issuance of mandatory federal identification cards. Despite token provisions that claim to give states the freedom to issue non-federal identification cards, the card will be mandatory for most — the PASS ID Act seeks to require everyone to show the federally recognized ID for “any official purpose,” including boarding a plane or entering a federal building. As legislative sessions kick in, it’s back to basics. Under the policy change, only applicants who have documents showing they have permission to stay in the U.S. for at least six months are eligible for Texas drivers’ licenses. But immigration attorneys are reporting that people who meet that criteria but are unable to produce documents required by the Department of Public Safety to prove their legal status are still being turned away.